45 players attended the International Open of Traiskirchen lastw eek-end. Besides a strong base of Austrian players, there were visitors from Germany, Hungary and the Czech Republic. Alexander Haas was in a great day as he defeated Robert Lenz on shots in the last 8 round, brother Wolfgang Haas on shots as well in the semi and Günther Bamberzky (3-1) in the final. Moritz Jung from Germany won the U19 final against Lukas Eppensteiner and the U15 final against Daniel Vranovitz. Austians dominated the veterans section with Stefan Sandner beating Manfred Pawlica in the final. Daria Prazynski (ladies) and Caspar Heinrich (U12) were the other individual winners. 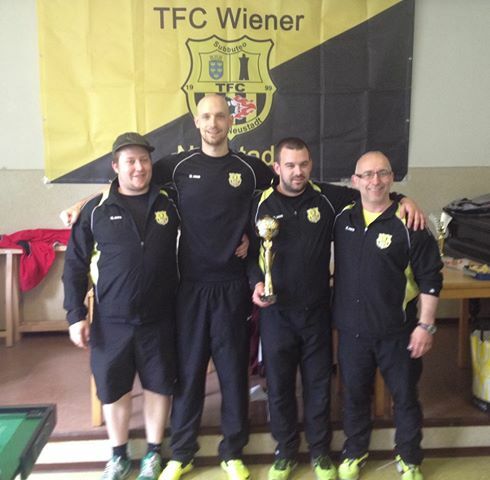 The team event saw many close games but int he end, the TFC Wiener Neustadt players took the best on TFC Mattersburg on goal difference after a very close final (2-2 and 8 goals to 7). This entry was posted in FISTF News and tagged Austria, Results. Bookmark the permalink.